Move the marker to the bottom of the numbered scale. Stand up straight. Take a deep breath. Fill your lungs all the way. Hold your breath while you place the mouthpiece in your mouth, between your teeth. Close your lips around it. Do not put your tongue inside the hole. 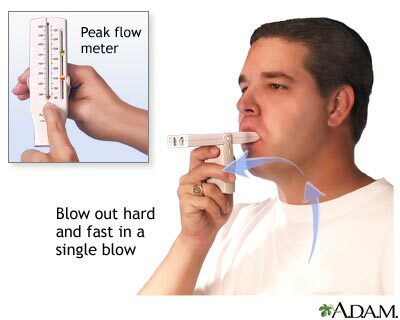 Blow out as hard and fast as you can in a single blow. Your first burst of air is the most important, so blowing for a longer time will not affect your result. Write down the number you get. If you coughed or did not do the steps right, do not write down the number. Do it over again. Move the marker back to the bottom and repeat these steps 2 more times. The highest of the 3 numbers is your peak flow number. Write it down in your results log.